When I first had the chance to check this series out, I thought it was going to delve into lots of Scottish history, from battles to political intrigue. Which of course it did, with episodes focused on William Wallace and Rob Roy, but the other two episodes were on the Loch Ness Monster and haunted places of Edinburgh! So, not exactly the most concise bunch of stories to describe ancient Scotland. 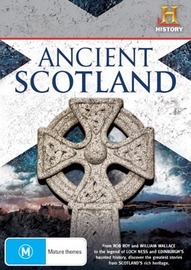 Due to the wide reaching subject matter, didn’t make it feel like a great DVD for someone who wants to really ‘know’ about ancient Scotland, but more made for the person who just wants to sit back and be entertained with the basics over various subjects. So I’m not saying that’s a bad thing, just that it wasn’t what I was expecting.